Get the guide that compares the functional advantages of each fund accounting software platform. Whether you’re investing in your first accounting software or are switching to a new platform, it’s important to find a solution that best fits your nonprofit. 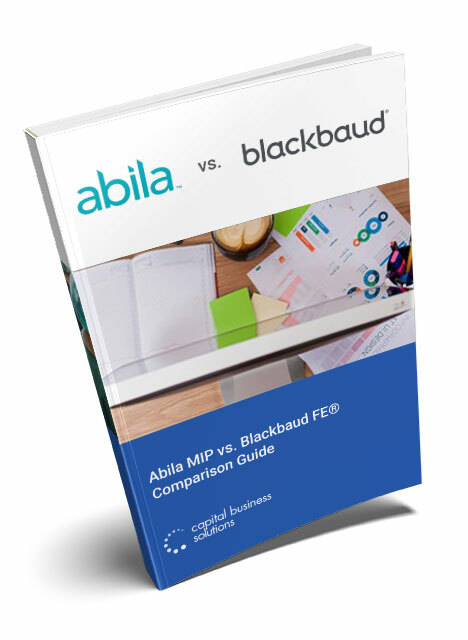 Abila MIP® and Blackbaud’s Financial Edge® are two of the most popular accounting software solutions. *Capital Business Solutions has been providing accounting and fundraising solutions for nonprofit and governmental organizations for over 20 years. Our Guide is meant to provide end users with points of consideration, allowing them to choose a software platform that best fits their organization’s needs.